"TUT’s Stars" will take young audiences on an amazing, fully immersive 3D adventure across the ancient valleys of Egypt, the pyramids and to the heavens beyond. 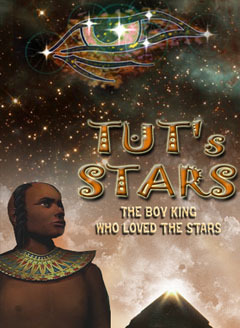 Tut’s Stars is about a ten year old boy who together with his parents embarks on a tour of the Valley of Kings in Egypt. During the tour, the little boy decides to hide in King Tutankhamen’s burial chamber as the rest of the tour leaves for the day. Alone, the little boy emerges from his hiding spot to look around in awe at the chamber and the tomb that lies before him. With his limited knowledge of Egypt, the boy searches the walls of ancient writings to note that the boy king, TUT was very much into the heavens and stars. Suddenly, the boy king’s spirit arises from the tomb. TUT introduces himself to the boy, and tells the boy not to be afraid. Upon getting to know a little bit about each other, the boy asks TUT about the writings on the walls, particularly those that depict the boy king pointing to the heavens. TUT then begins to tell the young boy about life in Egypt and how he became king and then proceeds to tell the young boy about his fascination with the stars. the boy learns how the ancients made pictures in the skies out of constellations. The boy also learns how ancient observers of stars created some of the first astronomical calendars and built huge monoliths as part of their observations. TUT’s Stars will take young audiences on an amazing 26 minute, fully immersive 3D adventure across the ancient valleys of Egypt, the pyramids and to the heavens beyond. This feature is designed to provide the full dome planetarium marketplace with astronomical content that is history focused and one that primarily deals with star constellations.